Is it Wrong to Pick up Girls in a Dungeon? Anime gets a second season! Filed to: Is it Wrong to Pick up Girls in a DUngeon?Filed to: Is it Wrong to Pick up Girls in a DUngeon? 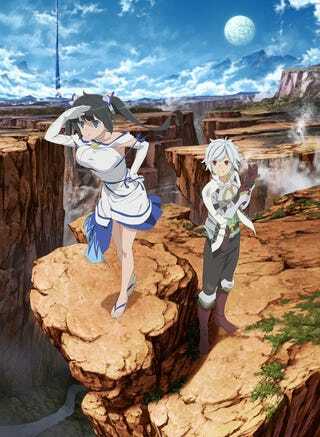 During the event “GA Bunko Happyou Stage” t ahs been revealed that the anime based on the Light Novel Series” Is it Wrong to Pick Up Girls in a Dungeon” is getting a second season and a movie. The Movie has the surname “Arrow of the Orion” and will be written by the Light Novel author Fujino Oumori. “Life in the bustling city of Orario is never dull, especially for Bell Cranel, a naïve young man who hopes to become the greatest adventurer in the land. After a chance encounter with the lonely goddess, Hestia, his dreams become a little closer to reality. With her support, Bell embarks on a fantastic quest as he ventures deep within the city’s monster-filled catacombs, known only as the “Dungeon.” Death lurks around every corner in the cavernous depths of this terrifying labyrinth, and a mysterious power moves amidst the shadows.